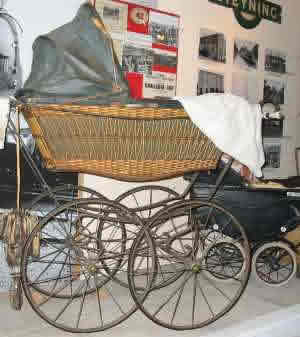 This is a magnificent Victorian pram. It has traditional basketwork, a leather hood and an iron frame with unmistakable Victorian engineering. John and Florence Banfield's five children were christened at Saint Andrew's church each wearing the lovely white gown shown draping from the pram. This was over 100 years ago when they lived in Church Street. John Banfield was a cooper. This is just one of many exhibits which take you straight back to people and times gone by. What was it like in the past? The Singer sewing machine, the manual shop till, the kitchen, cricket, school and wartime collections can each speak a thousand words!